First up, let’s laugh at that variant cover by Rob Liefeld. Why does he feel the need to make sure that Cable has immediate access to at least six guns and a boot knife? Isn’t that a tad…oh, I don’t know, excessive? I’ll curb my criticism to just that aspect and leave alone the knee pads and the idea that Cable’s just pulled a muscle in his groin. 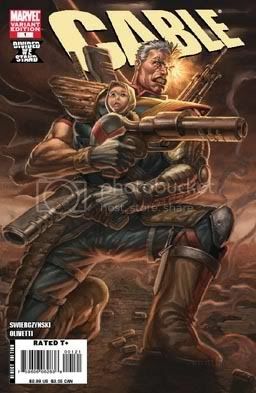 On the regular cover, however, Cable just has his one gun and a holstered pistol on his hip. That’s more reasonable, I’d say. One thing that doesn’t change is that Cable appears to be about the size of a house, both on the cover and throughout the issue. I suppose one of my main problems with Cable, from just a character standpoint, is that he hasn’t progressed out of the era that created him. He’s still “The Ultimate Mutant,” with tons of guns and guts and the ability to do just about anything. Why not modernize him and give him a few flaws or something (other than that stupid virus thing)? I suppose making him the sole protector of the first new mutant baby since M-Day is something, but it feels more like a crutch than something that’s actually relatable or interesting. At this issue’s close, Cable gets shot in the arm (in the same spot where he gets shot earlier in the issue!) and Bishop shows up to take the baby. By the way, Bishop’s right mechanical arm looks to be about the same size as the rest of his body combined. Side tangent: What’s wrong with Marvel Comics? Why is it that the middle page comes unstapled in just about one out of every five comics? That’s never happened to me with a DC issue. This is the concluding chapter to the “Alpha Lanterns” story-arc, in which Laira, a Green Lantern Corps member, as well as one of the “Lost Lanterns” that Hal Jordan supposedly killed way back when he turned into Parallax after Coast City got blowed up, is on trial for the murder of Sinestro Corps member Amon Sur. She’s found guilty, after which, the Guardians enact another new law into the President’s Book of Secrets, authorizing complete lethal force within the Green Lantern rings. Yikes. At issue’s close, Laira is chosen as a new member of the Red Lanterns, thanks to her possessing great rage. The reason I map out this little handy-dandy recap is to show you something interesting without explicitly stating it (until now, chumps!). For this being Hal Jordan’s book, he sure isn’t in it all that much. He has a short, interesting exchange with Sinestro, but, otherwise, this is all about the Green Lantern Corps. Which makes me wonder, why wasn’t this story-arc featured in, y’know, the Green Lantern Corps series? It would seem to fit a lot better. Next issue looks like the focus will shift back toward Hal, with the retelling of his origin. Should be fun. I shouldn’t have bought this. Count me among the small contingent of people who simply don’t enjoy Brian K. Vaughan. Do you have a reason, you might ask? Not really. I just think his writing is incredibly dull. And, due to the fact that he’s a supposed “superstar” writer (he’s even breached Hollywood, to write an occasional boring episode of LOST), this issue costs $3.99, even though it’s only 23 pages. Maybe the extra cost comes from the expensive price of the extra-thick cover. Either way, this shouldn’t have cost $3.99, and if I had taken the time to look, I would’ve saved my money. Seriously, how many friggin’ Wolverine comics do we need per month? And how is this story going to be any different or good if it’s only three issues long? I guess it’s being used to set up the idea that Logan can survive an A-Bomb, but whatever. That’s a horrible idea for a number of reasons. I don’t remember anything that happened in this issue, and I don’t feel like flipping through my copy, so I’m just going to go off of what I barely recollect. I think this issue ends with Robin and Nightwing teaming up to go fight Ra’s al Ghul. Again. Or maybe they need to talk to Ra’s about something. Oh yeah, somebody is stealing the corpses of dead supervillains, and Batman’s sons are trying to figure out why. I totally forget how that connects to Ra’s. I do remember that this issue has a fairly decent sense of humor, as it made me smirk a couple times, which I have never found comics to do. My reaction to most comics is, “Why so serious?” Nightwing’s been pretty fun lately, though. Remember last week when I said that I had lost all interest in X-Men books post-Messiah CompleX? Well, I started flipping through the first few pages of this issue and remembered that last issue, it ended with Angel landing in 1960s San Francisco, which I thought seemed really cool; therefore, I bought this up. Sadly, instead of somehow slipping into a cross-dimensional timewarp wormhole, it appears that there’s just a powerful psychic behind the whole reality-altering nonsense. That’s so much more predictable and boring than what I had in mind. Oh, plus, there’s a bar fight, since Wolverine’s got such a big temper and likes to drink and fight. How many times are we going to have to say, “Been there, done that” before they start churning out new ideas? I won’t know, I suppose, because I’m not going to buy Uncanny X-Men anymore. This is a nice little stand-alone story, where Batman delves into the mysteries surrounding his all new symbiote, er, Suit of Sorrows. Oh, wait, no it isn’t. It is a stand-alone story; that part I don’t wish to negate. My contention, however, is that it is not a nice little story. It is really boring and poorly written. Seriously, somebody should do a word count for the number of times they mention, “Suit of Sorrows” or, “Terrible Secret.” I’m sure you’d come up with some pretty high numbers. To its credit, I suppose it’s an interesting take on the classic Spider-Man symbiote suit storyline, only with Batman using the suit to test his willpower and ability to overcome such an overbearing uniform. Still, the more supernatural Detective Comics becomes, the more I tune out of it. Leave that hokey stuff for the other twenty Bat books. I like my Detective based in reality. Oh, and before I forget to mention it, what’s up with Robin these days? It seems that while Batman goes out fighting crime, Robin sits in the cave, messing around on the Batcomputer or something. 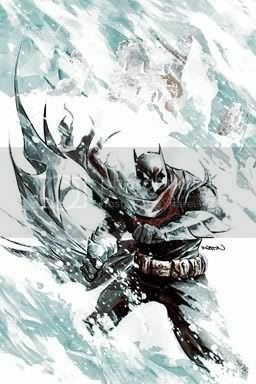 Am I missing a book where they actually team up, or is Batman purposefully keeping Robin out of the game to protect him? Has this been explained somewhere? I mean, for a sidekick, he’s barely ever fighting at Batman’s side. 7. Countdown to Final Crisis #8. Aha! I fooled you! There are only six reviews here! I already reviewed Countdown earlier last week! It was terrible; do you think I want to relive that? That $3.99 would’ve got you two huge meals in Costa Rica. Ha! I wasn’t fooled by Logan #1. Was it really 23 pages? I remember picking it up, feeling it flop in the wind, see the price, and put it right back on the rack. Also, cause I’ve never said this before… Thank you so much for taking one for the team with the whole Countdown thing. As a longtime DC fan, that series just bums me out! That’s a good idea. You are now not the only person who wishes that. I think having structure like that would be a fun challenge for writers, and I think giving the multiple titles their own identity could only help. Well, maybe we’ll get our dynamic duo wish after Final Crisis… Assuming Bruce Wayne doesn’t become a 5th Age Newer God…or, something. Ugh.